Yohan Cabaye looks set for a summer return to the Premier League with the French media confirming that the Arsenal and Liverpool target is nearing the exit door at Paris Saint-Germain, confirm Le 10 Sport. The playmaker is a long-term target for both the Premier League giants, and was linked at the start of this month by talkSPORT. With Steven Gerrard departing Liverpool in the summer, Brendan Rodgers needs to replace his long-serving captain, while Arsenal are also short centrally. 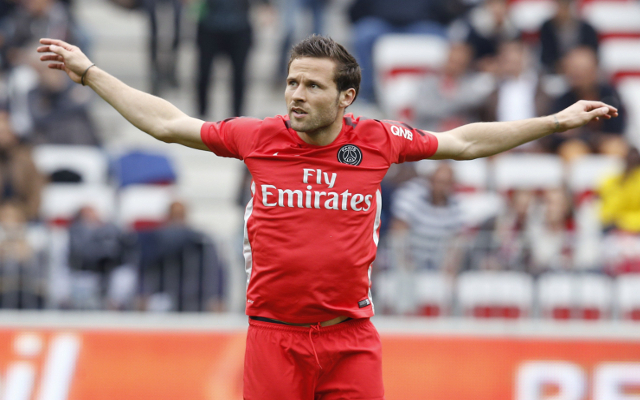 Cabaye only left Newcastle United a year and a half ago, but has struggled to impress at the Parc des Princes. With Laurent Blanc preferring the talented and complementary midfield trio of Marco Verratti, Blaise Matuidi and Thiago Motta, and with Adrian Rabiot a talented option from the bench, Cabaye’s playing time has been limited this term. The former Magpie has managed only 13 starts in Ligue 1, although injuries and a lack of form have also affected his progress. The 29-year-old has been linked with a move away from the club this summer, with Italian source Leggo revealing recently that AS Roma had joined the hunt for the Liverpool and Arsenal target. Le 10 Sport confirm that the former LOSC Lille man is set for a departure from PSG this summer, and it would be a surprise if Cabaye was still at the Parc des Princes next season. According to respected French journalist Pierre Menes of Canal +, writing on his Twitter account, the midfielder’s most likely destination looks like England, where he retains many admirers. “Are Liverpool interested in [Ezequiel] Lavezzi and Cabaye?” he began, “I don’t know. The player has previously admitted that he is considering his options with the 2016 European Championships in mind. “It’s a strange moment in my career,” Cabaye began, as reported by Le 10 Sport. “I have never been here before. “It’s important to accept it, but we don’t do anything to change it. The European Championships will be an important criteria,” he continued. “I will speak to the national team coach [Didier Deschamps] with my representatives and then speak to the club.